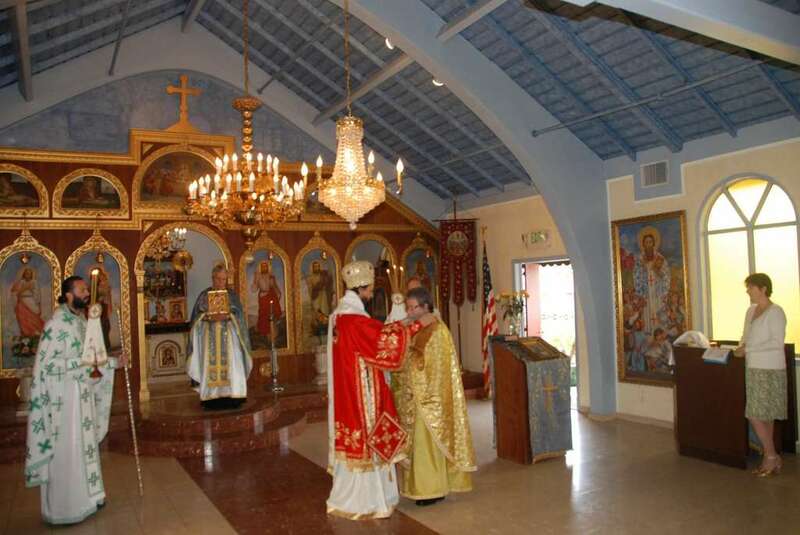 Arcadia, CA - On Sunday, May 29, 2011, the Sunday of the Blind Man Venerable Theodore the Sanctified, Hieromartyr Theodore of Vrsac, and new-Martyr Vukasin, the community of the Christ the Saviour parish in Arcadia, California celebrated their Patronal Feast. The Heirarchical Divine Liturgy was celebrated by His Grace, Bishop Maxim, Fr. Borislav Jegarski (Retiring Parish Priest), Fr. Stevo Kovacevich (Newly Appointed Parish Priest), Fr. Ilija Dajkovic (Retired Priest) Fr. Hieromonk Jovan Babic (Diocesan Assistant Chancelor) and the parishioners of the Christ the Savior parish..
On this special day of celebration, His Grace Bishiop Maxim elevated Fr. Borislav Jegarski to Stavrophore and introduced Fr. Stevo Kovacevich to the parishioners of Christ the Savior Serbian Orthodox Church. The Ritual of the Cutting of the Slava Kolach took place in the social hall followed by a wonderful celebratory banquet and an afternoon of fellowship!